○ Some scholars are hoping for China's coordination in settling the Rohingya problem. 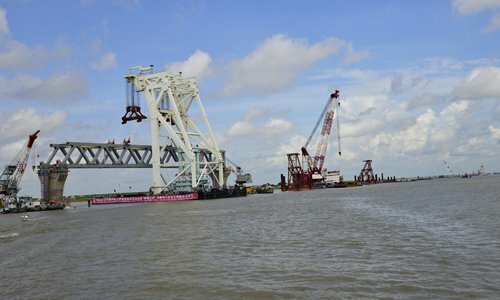 Bangladesh's Padma Bridge is now visible after its fifth span was installed on June 29, 2018 by engineers of the China Major Bridge Engineering Company. Photo: IC. Bangladeshi experts and scholars raised tough questions about Rohingya refugees and the so-called debt trap to the Global Times following the "Dialogue on China-Bangladesh relations: predicting the future" symposium held on December 8, 2018, in Dhaka, capital of Bangladesh. The symposium was hosted by COSMOS, a prominent local think tank that grew out of a leading energy and media company in Bangladesh. COSMOS told the Global Times that the symposium reflects Bangladesh's attention and appreciation toward its good relationship with China. The dialogue was held to provide a platform for officials and scholars concerned about the future of the China-Bangladesh relationship. Bangladesh is a country in South Asia, with a land area of about 150,000 square kilometers. It is one of the most populous countries in the world, with the highest fertility rate in Asia. At the symposium, many experts and scholars said that developing a good relationship with China has been the consensus of a majority of Bangladeshis. Though they admit Chinese investment brings many advantages, they have also become more concerned about "the other side of the coin" - whether Chinese investment could drag their country into debt risk. On the issue of the so-called debt trap, some Bangladeshi scholars repeat the local and Western media reports, claiming that China has lent and invested more than $30 billion in Bangladesh, according to their calculations. They have worried that Bangladesh will follow the same path as Sri Lanka, which has transferred an important strategic port, Hambantota Port, with a 99-year lease to China because it cannot pay its debt to China. "We don't know what attracts China to invest in Bangladesh. Please avoid using diplomatic discourse like 'because of our friendship,'" said Arif Mahmud, a senior journalist of The Independent, an English-language daily newspaper in Dhaka. He is deeply concerned about bilateral issues between China and Bangladesh. He even follows several social media accounts for Chinese state media, including the People's Daily and the Global Times, on his mobile phone. "Can you tell me more about China's work at the Hambantota Port? There is a lot of talk, especially in the Indian media, that this is the first strategic resource that China has gotten in South Asia using the 'debt trap,' and this would not be the last one," he continued. "Very few Chinese people are willing to talk about these specific issues." Perhaps out of politeness, Professor Afsan Chowdhury from the Brac University did not use the term "debt trap" but a softer claim - "debt overwhelming" instead. As far as he knows, China's investment in Bangladesh may cause debt overwhelming, he said. Since last year, some Western media outlets have accused China of using the "debt trap" to expand its influence to Sri Lanka and other countries along the Belt and Road route. They alleged that China has lured countries of strategic significance into the "debt trap" by giving them huge loans, then taking over infrastructure projects there after these less developed countries fail to repay the debt. Indian scholar Brahma Chellaney described it as "debt-trap diplomacy." Chellaney's claim reflects India's declining ability to control South Asia, while US media has expressed anxiety about the shift and flow of US and Chinese power. Both Chellaney and US media have depicted economic and trade cooperation as "economic aggression." The concern of Bangladeshis is noteworthy. As Mohammed put it, issues such as the "debt trap" are sensitive topics for local people. "Why do the Chinese invest here? 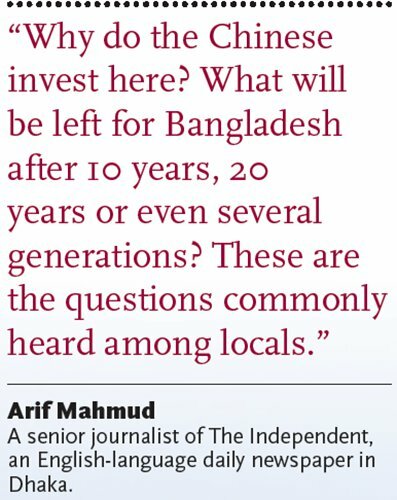 What will be left for Bangladesh after 10 years, 20 years or even several generations? These are the questions commonly heard among locals," he said. "It is a pity that although many Chinese media have voices on these issues, most Bangladeshis still cannot fully hear these Chinese voices due to language accessibility and other reasons," he added. Is Chinese investment an opportunity or a threat to Bangladesh? The answer is obvious. After the symposium, the Global Times reporter visited the Shahjalal fertilizer factory in northeast Bangladesh. This is a typical China-Bangladesh project under the Belt and Road Initiative. The plant was built by a Chinese company and has saved Bangladesh more than $400 million in foreign exchange every year. The factory is free of dust, noise, air pollution, peculiar smells and water pollution. 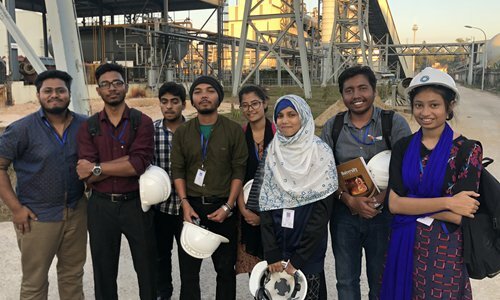 A group of Bangladeshi university students are interning at the plant, and the Shahjalal fertilizer factory is now regarded by more than 40 Bangladeshi universities as an education and training base. According to the director of the factory, the plant employed more than 4,000 local workers at the peak of its construction, and provided more than 1,300 jobs after it was put into production. While Professor Afsan Chowdhury worries about "excessive debt," he admits that Chinese investment is welcomed by most Bangladeshis. In Chowdhury's opinion, investment from China not only benefits Bangladesh, but also provides another option for the country. "Investment from China actually diminishes our dependence on India." Geopolitics is another sensitive topic of concern for Bangladeshi academics. What is now Bangladesh was once part of Pakistan's territory before Bangladesh gained independence with the support of India. By communicating with local residents, the Global Times found that India is still providing substantial loans to Bangladesh for infrastructure construction, such as expressways and power plants. "In fact, Indian people despise us, and they are just exploiting us," an anonymous local media worker told the Global Times. "However, Bangladeshis feel stifled by India, whose sheer asymmetry in size and resources make the bilateral relationship uncomfortable," said Chowdhury. "Thus, to many in Bangladesh, China offers an opportunity to try to balance the power relations." "Compared with India, China has had more of an economic than a political role, which is more welcomed by the Bangladeshi government and people," he continued. He also believes China should have better communication with the local people and let more Bangladeshis know their real purposes in the country. It is worth mentioning that a number of academicians and scholars at the seminar with military or government backgrounds were concerned about the Rohingya refugee issue. They believe that projects with the Bangladesh, China, India and Myanmar Economic Corridor and the Belt and Road Initiative will suffer setbacks if the issue cannot be tackled properly. Some Bangladeshi scholars claimed that China has been supporting Myanmar on this issue and has ignored the views of Bangladesh. A senior official with the Ministry of Home Affairs of Bangladesh told the Global Times previously that the government spent at least $1 million to settle Rohingya refugees, who had escaped from Myanmar, in Bangladesh. "We are a country of small size, and independently solving the problem of Rohingya refugees is out of our capability. We hope the Chinese government can help coordinate all parties and bring them back home soon," the official said. Mahmud and Chowdhury said they believe that China takes Myanmar's side on the Rohingya problem, and they talked about China's responsibility to coordinate and balance on the refugee issue as a major country. Generally speaking, the Rohingya problem is a domestic issue of Myanmar, while the settlement of Rohingya refugees is an international matter between Myanmar and Bangladesh. China is willing to play a constructive role in it, but using "long-arm" influence like the US does is not an option for Chinese diplomacy, experts said.